‘An Undertaking’ is an art exhibition paying tribute to local men who lost their lives in World War One. The show is compelling with its personal emphasis; in one installation you are a fighter pilot doing your bit, in another you are re-living a soldier’s childhood memory, in another you see an idyllic world without war, and in another are figures, almost real, sitting alongside you. The exhibition runs at St Chad’s, Shrewsbury from Saturday 4th August – Sunday 30th September. It is a timely tribute as this year marks the hundred-year anniversary that the First World War ended. Organised by Shrewsbury-based artists Keith Ashford, Jacqui Dodds, Jill Impey, and Julie Edwards, who are members of collective ‘re:collect’ had mentoring from Newtown’s Oriel Davies Gallery Curator Alex Boyd Jones for the project. 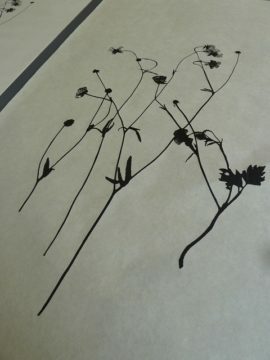 Despite a sensitive subject matter, the artists have skilfully and respectfully represented themes of war and of peace. Keith Ashford memorialises the loss of youth in his installation. He depicts the first successful British flighted plane in World War One, the SE5a through a reinvention of the KeilKraft rubber band powered balsa and tissue model he played with as a boy. Keith redrew the plans from the originals and sent the digital versions to be laser-cut then assembled them as clear acrylic versions. 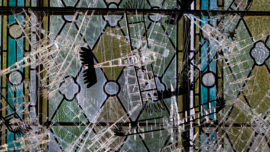 The original models were his inspiration, however he added parts with birds’ wings linking with Jill’s work. The models are grouped close together against the glass window alluding to the challenges of flying, and combat in the air. 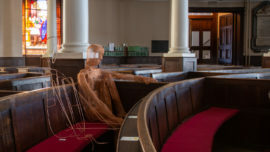 The installation was placed in the window at the back of the church, so they would face Julie’s sculptures. The clear material camouflages them against the glass – an important strategy for pilots to survive. The model planes reveal that little did some young men know that the airplanes they played with as boys would materialise into real machines they would deploy when they grew up. With just fifteen hours of training the men would then be in the air. Not all of them came home as the average life expectancy of an allied pilot was eleven days on the front line. In her work, Jacqui Dodd focuses on Shropshire soldier, Wilfred Owen. In reading his biography she discovered that as a youngster Owen would take the ferry with his family from Underdale Road to Haughmond Hill where they would walk in fields of buttercups. One of Owen’s poems Spring Offensive, displayed alongside Jacqui’s work, talks of the men’s boots being golden with buttercups. It is a link to happy memories of togetherness to escape the horrors of war; and is perhaps also a wish for peace so that he could return home. Jacqui photographed the buttercups at Haughmond Hill to familiarise herself with the landscape. These photographs then led to a blind embossing which she achieved by making the paper wet before applying the stamp of the image. She also did screen prints, the one on the left as you make your way into the church vestibule has been enlarged from the original. It has no colour perhaps to represent the weighty responsibility Owen and others had on behalf of their country. To bring some hope, Jacqui reconstructed a buttercup field by having cards with coloured screen prints displayed on the church pews – which viewed from above show rows of yellow flowers. The short films by Jill Impey also focus on nature. Projected as a circular frame onto the wall. 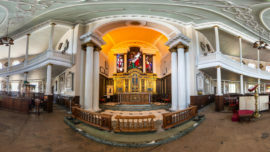 ‘Jack-the-lad’ is a three-minute video installation in the church entrance showing a bird calling to his mate. It is filmed in Shrewsbury and shows a tree in blossom, signifying spring. The installation is intended to embody the presence of those who were left behind by those who went to fight. The blossom might also serve as a metaphor for the hope held by many in Britain at the time – that it would be a short war, easily won. The reality was that it took four years before victory could be declared for Britain and the Allies. 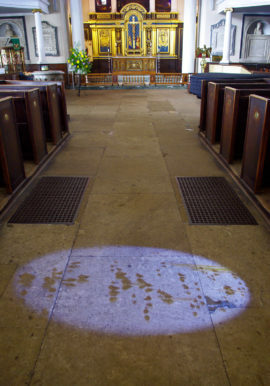 Jill’s other pieces also use the building’s architecture for display – one is projected onto the stone floor, the other onto a wooden pillar near the church’s altar. The former depicts water birds feeding in the water. Filmed in the Somme Valley, behind the memorial for unknown soldiers, French and otherwise, the scenes show how nature can rebuild itself. Instead of blood, mud, trenches, and soldiers with their weapons there is calm following the global conflict. The latter film shows fields of different grasses, to signify seeds of change since the scenes are shot in autumn time and they also represent seeds of war. The work of Julie Edwards focuses on human nature, of community. Julie has created two sculptures. Both are in metal with one resting his arm on the pew. This informal pose contrasts with formal contemporary depictions of service men in photographs. Inspiration was taken from a modern-day photograph of two teenagers eating pizza. 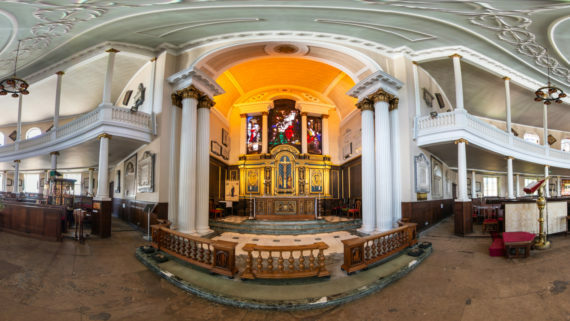 Julie intended the sculptures to be relatable, perhaps even depicting church-goers at St Chad’s. The aesthetic styles are different. The one on the left looks futuristic with the outline of the copper constructing the human form, whereas the other has more strands of metal interwoven together emphasising the soldier’s uniform. At certain points in the day with the sun shining through it is as if the men have moustaches, personal details created through the space rather than by the artist. The exhibition complements St Chad’s which has strong military links. A roll call is held each Wednesday to commemorate local servicemen from World War One. The religious figures in the stained-glass windows also add to the feelings of commemoration and contemplation for people to find in the church. With the passing of many who served in WW1 it is important to remember their courage and sacrifice in securing our freedom, and to pass that onto the next generation. As a young girl who visited the exhibition commented, the works are, quite rightly, ‘windows into the past’. *Melissa has a strong arts background with a BA in History from the University of Southampton and a MA in History of Design from the Victoria and Albert Museum/Royal College of Art. As well as working in communications she is a regular volunteer at Participate Contemporary Artspace and recently curated the gallery’s exhibition ‘Lawn and Meadow’ (July 24th-August 11th).